News - Speaker Schedule for Dec, Jan and Feb Meetings Established. The Sandy Chapter will be presenting a series of seminars during our December, January and February general meetings. These seminars are designed to assist anyone wishing to learn a little more about fishing on the Sandy River. 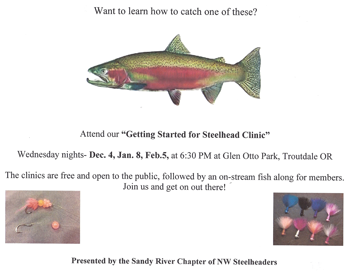 These seminars will help prepare you for the winter steelhead season. Be sure to check out the future events on our Events calendar.